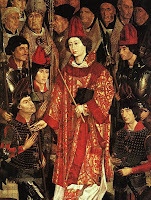 As a follow-up to Shawn’s recent and not-so-recent posts on the Saints of the Roman Canon, I will here offer some considerations of the Saints named in the Canon of the Ambrosian Rite, starting with those in the Communicantes. A second post will enumerate those in the Nobis quoque, and a third will discuss some of the other differences between the Roman and Milanese versions of the Canon. The traditional Ambrosian liturgy is of course very different from the Roman, but also shares with it a large number of texts and rites. 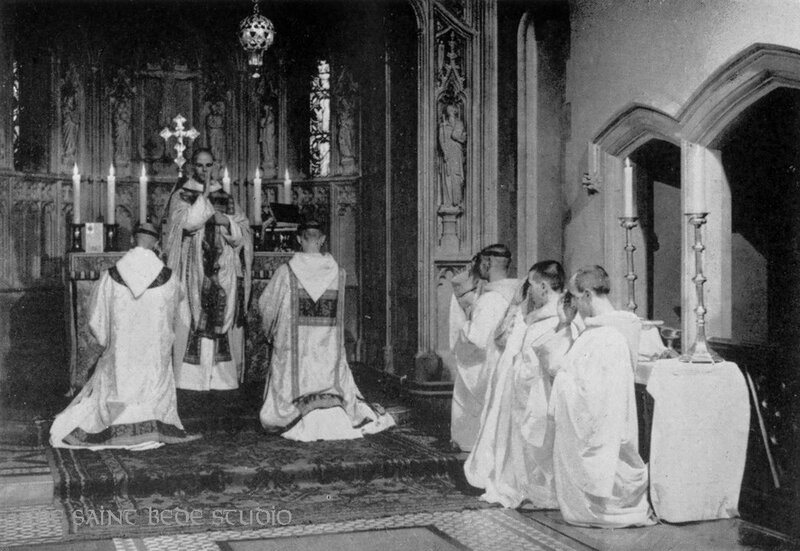 Foremost among them is the Canon of the Mass itself, which is mostly the same as the Roman Canon; this fact mislead the liturgical scholars of earlier periods to think that the Ambrosian Rite was simply an archaic version of the Roman, a theory now happily abandoned. There are several minor differences in wording (e.g. “ante conspectum tremendae majestatis tuae” in the Supplices), and a few noteworthy interpolations, but the place where the Canon varies most extensively is in the two lists of Saints. We may also note in passing that Milan was not the only place where these lists differ from the very ancient Roman tradition; in France, for example, many places added the names of Ss. Martin of Tour and Hilary of Poitier to the Communicantes. However, variants of this sort among the uses of the Roman Rite are very rare, and had almost completely disappeared at the time of the Tridentine reform. The Ambrosian Communicantes begins as the Roman does, with the Virgin Mary and the twelve Apostles, in the same order as in the Roman Canon and Litany of the Saints. After the Apostles, however, the Ambrosian Rite does not observe the strictly hierarchical (and mostly chronological) order of the Roman Rite. Ss. Linus and Cletus are omitted, and St. Clement is moved; the Apostles are followed directly by Pope Sixtus II, who was martyred in the persecution of Valerian in 257, and was in antiquity the most venerated of the martyred Popes after St. Peter himself. Right after him are named two saints with whom he is associated, his deacon, the martyr St. Lawrence, and St. Hippolytus, a soldier who was killed after burying the body of Lawrence. 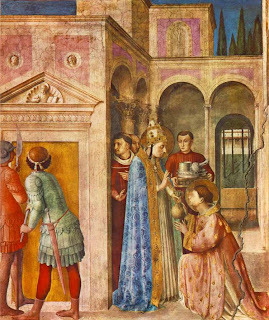 St. Lawrence receives the treasures of the Church from St. Sixtus to distribute to the poor; Beato Angelico, Niccoline Chapel, Vatican City, 1447-51. Pope St. Clement I, the third successor of St. Peter, is placed after Cyprian, followed by five other martyrs, in the same order as in the Roman Canon: Chrysogonus, John and Paul, Cosmas and Damian. All six are honored at Rome by prominent churches; the basilica of Ss. Cosmas and Damian was built in 527, but the churches of the other four date back to the fourth century, and would have been known to St. Ambrose. Although the names and order of the Saints thus far are not identical, both versions of the Canon share one important characteristic; the twelve Apostles are followed by twelve especially famous martyrs, a total of twenty-four, representing the twenty-four elders seen by St. John before the throne of God in the fourth chapter of the Apocalypse. At this point, the Ambrosian Rite adds the names of ten other martyrs, nine of whom are particularly associated with Milan. The first, however, St. Apollinaris, was the founder of the church of Ravenna, which succeeded Milan as the capital of the Roman Empire in 402, five years after St. Ambrose’s death. He is included among the local martyrs most probably because Ravenna, like all of northern Italy, was part of the ecclesiastical province of Milan in late antiquity, and placed first as the earliest, and the only cleric among them. Apollinaris was traditionally said to have been a disciple of St. Peter, and to have preached throughout the north of Italy before his martyrdom at Ravenna in the later part of the first century. 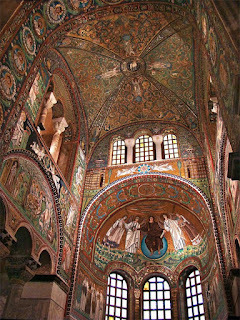 One of the most famous mosaics of the early Byzantine period, in the apse of the Basilica of St. Apollinaris in Classe, the former port of Ravenna, dedicated in 549 A.D. He is followed by St. Vitalis, the father of two other martyrs named shortly thereafter, Ss. Protasius and Gervasius. His feast is kept on April 28th in both rites, but Milan adds his wife St. Valeria to his Mass and Office. The account of their martyrdom is considered unreliable by modern scholars, as is that of their sons; according to the story, Vitalis was a soldier from Milan, who was identified as a Christian when he encouraged the martyr Ursicinus as the latter was being tortured. After burying Ursicinus, he was condemned, thrown into a pit, and overwhelmed with stones and earth. 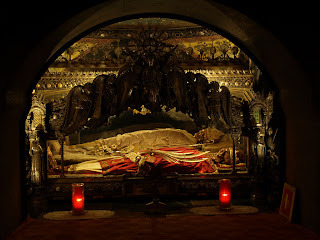 This took place at Ravenna, where the famous basilica named for him stands on the putative site of his martyrdom; this connection with Ravenna may have also brought devotion to St. Apollinaris to Milan. Valeria returned to Milan, where she was beaten by pagans after refusing to sacrifice to the idols, and died shortly thereafter of her wounds. 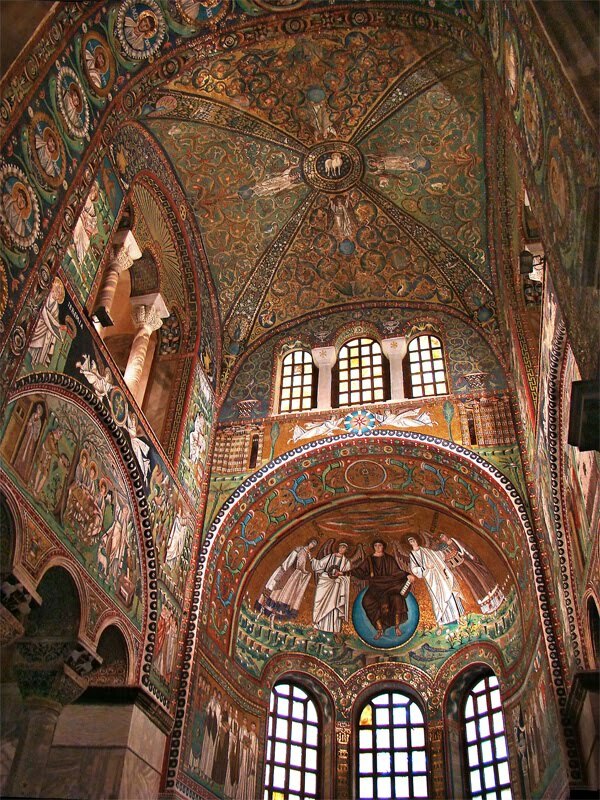 The apse of the Basilica of St. Vitalis in Ravenna, also filled with important early Byzantine mosaics, dedicated in 548 A.D.
Ss. Nazarius and Celsus, the next in the list, are kept in both rites on July 28th, but the Roman Rite adds two Popes to their feast, Ss. Victor I and Innocent I. Their unreliable passion states that Nazarius was an itinerant preacher in the first century, who journeyed through various parts of northern Italy and Gaul, and to whom Celsus’ mother entrusted her son to be baptized and raised as a Christian; thereafter, he shared Nazarius’ travels and missionary activities, as well as his martyrdom at Milan. Their bodies were discovered by St. Ambrose in 395 A.D. in a garden outside the city walls, the blood of St. Nazarius being still fresh and red; the relics were then translated to the Basilica of the Twelve Apostles. The feast of this translation is kept in the traditional Ambrosian Rite on May 10th. Nine years earlier, St. Ambrose had uncovered the relics of another pair of Milanese martyrs, Ss. Protasius and Gervasius, having been shown the place of their long-forgotten burial in a dream. Nothing is known for certain of these saints, not even the era of their martyrdom, but devotion to them was once very widespread; they are even named in the Roman version of the Litany of the Saints, last among the company of the martyrs. Their relics were taken to a newly built basilica, then called simply “the Basilica of the Martyrs”, and laid in a place Ambrose had originally intended for his own burial; the translation and the miraculous healings which accompanied it are recorded by Ambrose, by his secretary, Paulinus, who would later write his Life, and by St. Augustine. The great bishop and doctor himself was laid to rest next to them when he died in 397, and the basilica is now officially named after him. 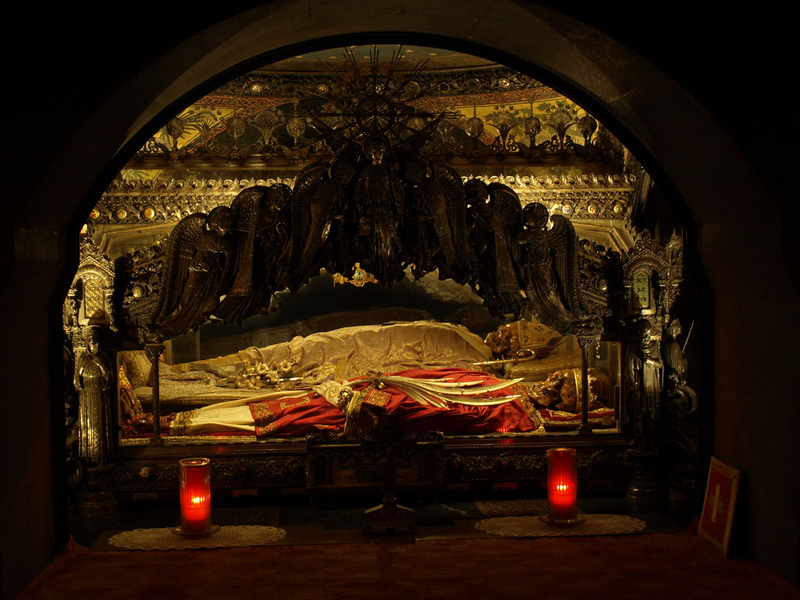 In the mid-ninth century, the abbot of the attached monastery placed the relics of all three saints in a large porphyry sarcophagus, which was later sunk into the floor and covered over; it was rediscovered in 1864 during a major restoration project, and the three bodies are now seen in the Confession of the church under the altar. The feast day of the two martyrs is on June 19th, and the traditional Ambrosian Calendar also has the feast of the “Raising up of the Bodies of Ss. Ambrose, Protasius and Gervasius” on May 14th. The body of St. Ambrose, dressed in the white of Confessors, rests between those of the martyrs Protasius and Gervasius, dressed in red. The two martyrs also hold palm branches in their hands, while the sainted bishop holds a crook. A few years ago, I visited this church and was told by a senior cleric that St. Ambrose's skeleton was found "all of a piece" in 1867, but that those of Protasius and Gervasius had been "mixed up, so at the Final Judgement, some of the pieces will be flying back and forth." This was followed by a smile and the classic Italian "no problem" shrug. The martyrdom of Ss. Nabor and Felix, from the screen above the choir stalls of Cologne Cathedral. After Milan was taken by the emperor Frederic Barbarossa, a portion of the Saints' relics, along with relics venerated as those of the Three Kings, was taken to Cologne, and a placed in a side chapel of the cathedral. Another Italian martyr, St. Gregory of Spoleto, whose relics were brought to Cologne in the 10th century, is shown on the far right. The last of the martyrs is an early bishop of Milan, St. Calimerius. The chronology of the bishops of Milan before the Constantinian peace is quite uncertain, and the episcopacy of Calimerius, traditionally said to run from 138 to 192 A.D., may in fact have been in the later part of the following century. The Ambrosian Breviary tells the story that on the death of his predecessor, St. Castrician, he strenuously resisted acceptance of the episcopal office, and had to be dragged in chains to his consecration. A basilica in Milan is named for him, and his feast day is kept on July 31st. Prior to the reform of the Ambrosian liturgy under St. Charles Borromeo, ten sainted Confessors were also named in the Canon of Mass. The first five were bishops of Milan: Ss. Maternus, (316-328), Eustorgius I, (344-350), Dionysius, (350-355), Ambrose (374-397) and Simplician (397-401). There then followed Ss. Martin of Tour, Eusebius of Vercelli, Hilary of Poitier, Pope Julius I and Benedict, bishop of Milan from 681-725. These names were removed from the Canon by St. Charles, who decreed, apparently on the analogy of the Roman Canon, that the Saints named therein should all be martyrs. 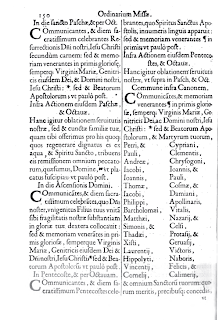 The relevant page of the Ambrosian Missal, from the 1712 edition published by the authority of Giuseppe Card. Archinto, archbishop of Milan from 1699-1712. 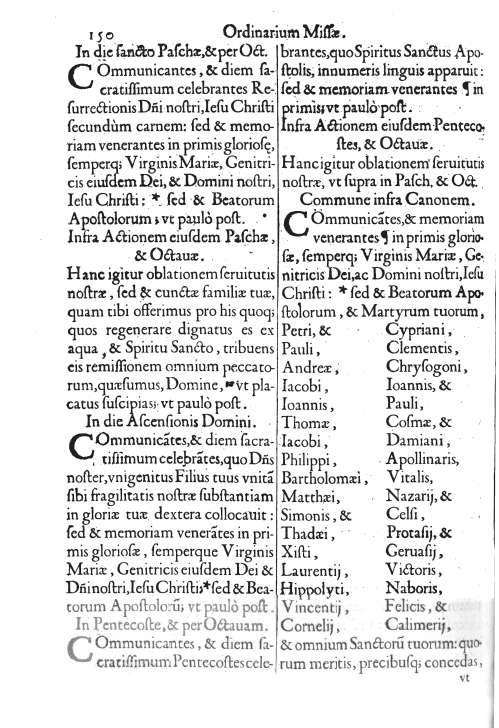 Finally, we may note that the list of Saints in both the Communicates and the Nobis quoque is printed in two parallel columns, rather than in a continuous line like the rest of the text: this custom is a remembrance of the ancient custom of reading the names from hinged plaques called diptychs. At the end of our recent article on Thomas More College, I noted that we would like to hear from other Catholic colleges. Accordingly, I was delighted to hear from Dr. Peter Kwasniewski of Wyoming Catholic College who shares an article with us which first appeared on Rorate caeli in February 2010 and which has been updated for posting here at NLM. 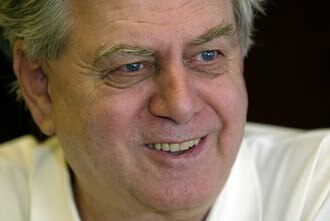 Pope Benedict XVI is leading the Church out of a forty-year captivity marked by a “hermeneutic of rupture and discontinuity” into a new era in which Vatican II can be seen for what it truly is: one among many Councils, in continuity with them, and not opposed to all that had come before. This is true in a special way of the Sacred Liturgy. Too often in recent decades the Holy Sacrifice of the Mass has been celebrated in a way that is quite different from, and even opposed to, the way it had been celebrated since time immemorial. The Pope is calling us back to a celebration in keeping with the dignity and mystery of the Eucharistic mystery. He is gently but firmly calling the Church back to continuity with her own Tradition. This is the deepest reason for his motu proprio liberating the Extraordinary Form of the Roman Rite: he wishes to see the two uses or forms exercising a mutual influence, such that lost continuity can be regained over time. It is a long term strategy with many immediate practical consequences. 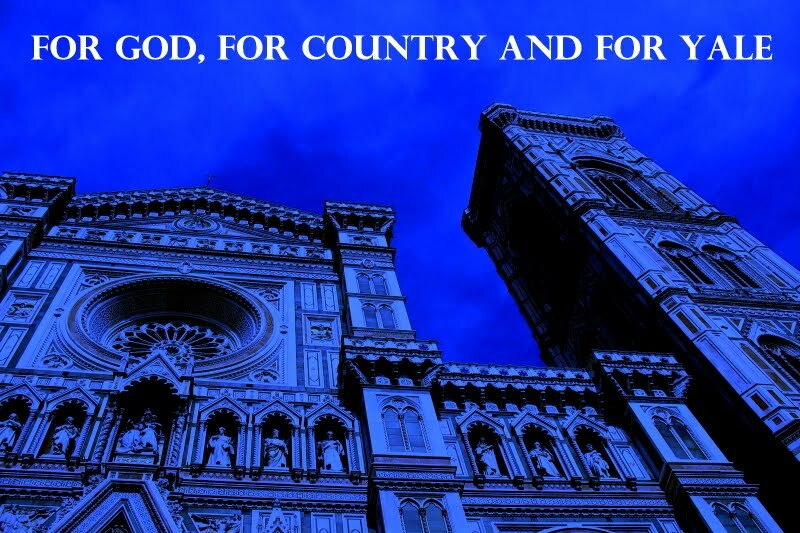 The “reform of the reform” has indeed begun, and the question that each knowledgeable Catholic must ask himself is this: Am I with the Pope and the real Vatican II, or am I de facto against the Pope because I wish to perpetuate a supposed “spirit of Vatican II”? 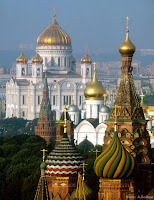 All over the world, parishes, chapels, and religious communities are adding the Extraordinary Form to their roster of Masses. The Pope’s example is beginning to have effects on the way Mass in the Ordinary Form is celebrated outside of the Vatican, especially in cities and in cathedrals. 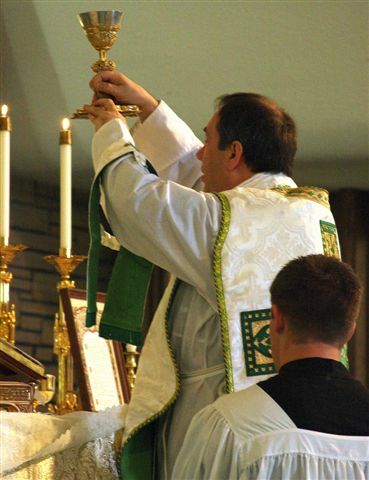 Plainchant and polyphony, ornate vessels and vestments, the Latin language, incense, and other such once familiar features of liturgy are returning in a way that could never have been foreseen even ten years ago. The seminaries and religious orders that are swelling most rapidly are those that have heartily embraced the Pope’s reforms. Catholic institutions of higher learning cannot remain unaffected by the momentous shift taking place in the life of the Church. Rather than keeping students in thrall to the outmoded mentality of the past few decades, a truly Catholic college will set them confidently along the path of the hermeneutic of continuity, following in the footsteps of the Vicar of Christ. For those who are hoping to hear good news in this regard, Wyoming Catholic College is truly a cause for rejoicing. This college is radical in its educational philosophy and curriculum, because we go back to the roots, the radices, of Western thought and culture. In the eyes of the world we are just about as “retro” as a college can be, but we are convinced that this is ultimately in the best interest of our students. Is it not the same with the liturgy and Catholic life? We want to be radical in the best sense—to connect with the deep roots that nourish our faith and identity as Catholics. 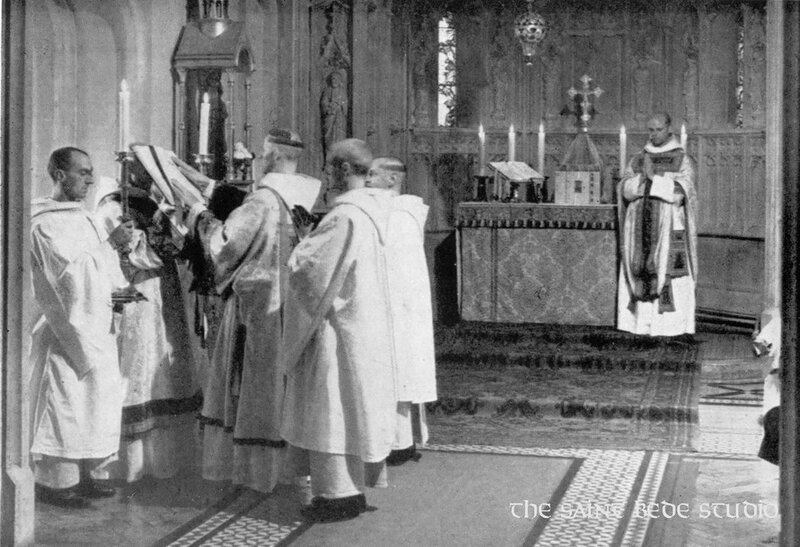 Traditional liturgy, be it Western or Eastern, is an essential part of this nourishment; so is the language of the Latin-rite Church and her musical patrimony. Wyoming Catholic College is grateful to Almighty God that we are able to provide such nourishment—the robust and hopeful vision of Pope Benedict XVI—to the future leaders of the Church in this country. As the Second Vatican Council teaches, the sacred liturgy—and above all, the Holy Eucharist—is “the source and summit” of the Christian life. 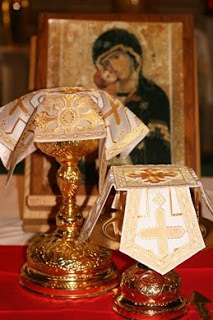 For this reason, the sacred liturgy is celebrated at Wyoming Catholic College with fidelity to the directives of Holy Mother Church and with loving attention to her Tradition. Taking inspiration and guidance from the teaching and example of Pope Benedict XVI, the College chaplaincy offers a rich liturgical life to students, faculty, staff, and members of the local community. 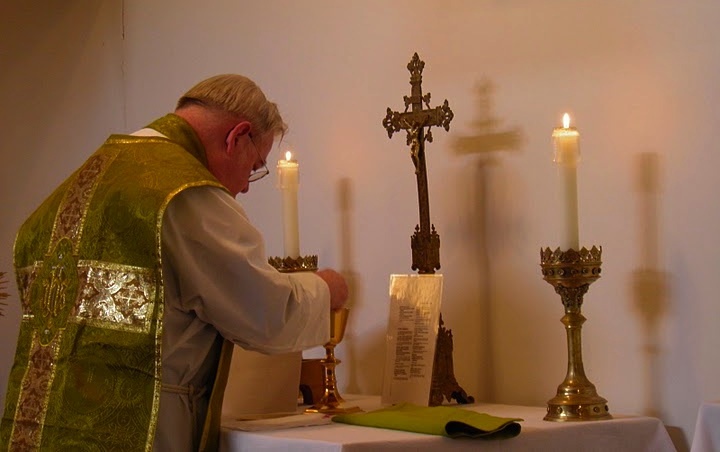 On most days of the week, the collegiate Mass is the Ordinary Form of the Roman Rite, celebrated in English, with common parts (Kyrie, Gloria, Sanctus, Pater Noster, etc.) sung in Gregorian chant, and with antiphons taken from the Graduale Simplex. The main collegiate Mass on Sundays is celebrated with special solemnity, the Schola singing the Introit, Offertory, and Communion antiphons and the College Choir providing hymns and polyphonic music. In keeping with the generous intentions of Summorum Pontificum, the Extraordinary Form of the Roman Rite is celebrated every Wednesday (12 pm), Saturday (11 am), and Sunday (8 am) by the College’s full-time resident chaplain. On Wednesday it is the only collegiate Mass offered and the majority of students attend it; on Saturday it is the only daily Mass in the town of Lander. On Sunday it is always a Missa Cantata. About twice a year, a biritual diocesan priest celebrates a fully sung Byzantine Divine Liturgy of St. John Chrysostom (Ukrainian recension). This, together with the Roman rite, affords all of us, including several Eastern-rite Catholics in the student body, a welcome opportunity to “breathe with both lungs” of the Church. Confessions, all-afternoon Eucharistic adoration, and evening Benediction are part of nearly every day’s schedule. Small groups of students gather daily to pray Lauds, Vespers, and Compline in Latin, and the Rosary in English. The College has been blessed with visits from a number of prelates who have celebrated the Holy Sacrifice of the Mass with us: The Most Rev. Daniel Cardinal DiNardo; Archbishop Charles J. Chaput, O.F.M. Cap. ; Bishop David L. Ricken of Green Bay (one of the College’s founders); Bishop Paul D. Etienne of Cheyenne; Bishop Michael J. Sheridan of Colorado Springs; Bishop Paul S. Coakley of Salinas; and Bishop James D. Conley, Auxiliary Bishop of Denver. Fr. Vernon Clark, a priest of the Diocese of Cheyenne who also ministers to the Carmelite monastery in Wyoming, has twice celebrated a Missa Cantata in the traditional Carmelite Rite. Other priests have made extended stays in Lander, either for personal visits or to assist in The Aquinas Institute for the Study of Sacred Doctrine, and during their stay have celebrated the Extraordinary Form, often as a series of sung Masses: Fr. Samuel Weber, OSB, formerly of the Institute of Sacred Music in St. Louis; Fr. Thomas Bolin, OSB, of the Monastero di San Benedetto in Norcia; Fr. Sebastian Walshe, O.Praem., of St. Michael’s Abbey in California; and Fr. John Zuhlsdorf. The local pastor has been most welcoming and accommodating towards all these visitors and has made a point of including the College’s liturgical and devotional schedule in his parish bulletin. The general attitude and approach of Wyoming Catholic College is this: whatever form or rite is being used, the sacred liturgy is to be offered in the most beautiful and dignified manner possible, characterized by obedience to current universal norms and by an immense respect for the Church’s ancient heritage. In recognition of the exalted place of the sacred liturgy in the life of the College, our academic schedule is devised to allow all students and faculty to attend every day. The College promotes a culture of daily attendance at Mass and we are pleased to see that a majority of the students do attend daily. 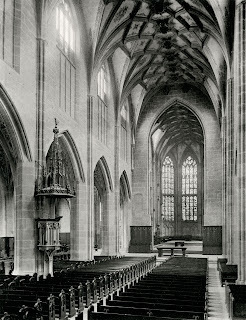 The Berner Münster, featured in our recent quiz, was built as the cathedral of Bern, Switzerland; as with many large churches, the construction of the main body of the building spanned a considerable period, from 1421 to 1575, and the bell-tower was not finished until over three centuries later. 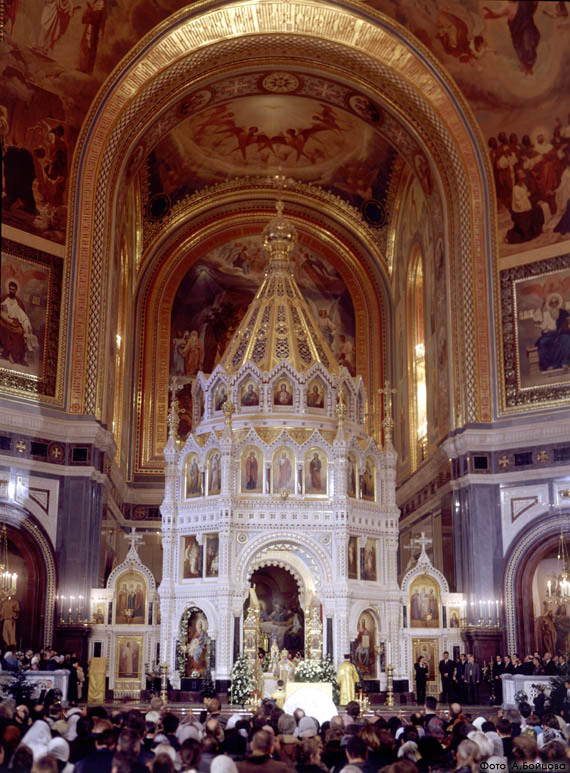 In this midst of this period, when the city became Protestant, over forty side altars were removed, and a large number of statues and paintings removed from the church, leaving a very sparse interior. 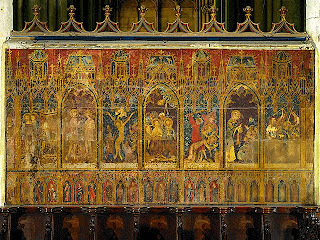 However, some of the decorations which early Calvinists would certainly not have created of their own initiative were left untouched, most notably the Last Judgement over the main door, and most of the stained glass windows in the apse of the church. The exterior ca. 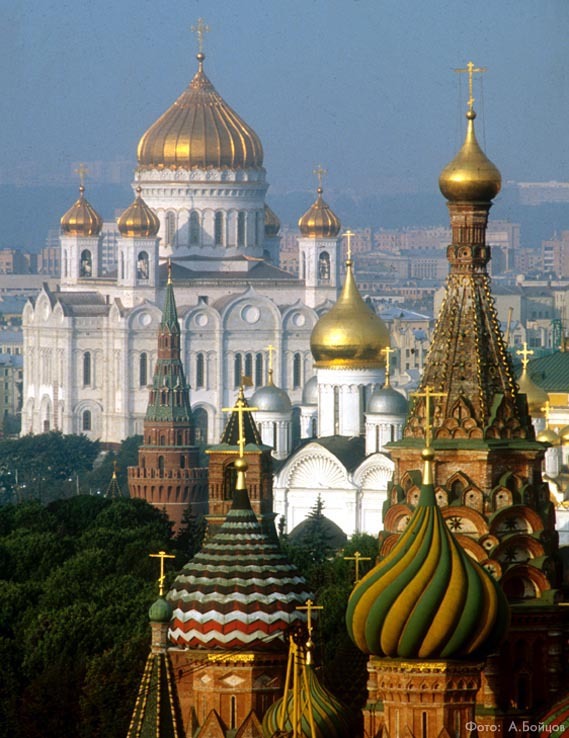 1800; the bell-tower was finally completed in 1893. On the right can be seen the Fountain of Moses, one of several decorative fountains throughout the city. The main portal of the Last Judgement, ca. 1460-1480, which contains the only statues left in place after the Reformation. Several of the originals have been moved to a local museum, and replaced with copies here. The Saved. 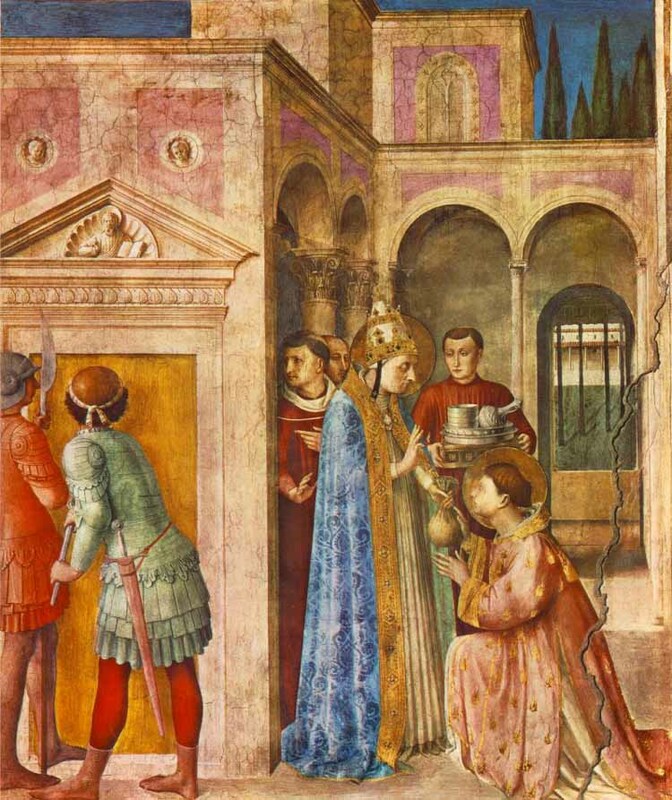 Note that the first person entering the Gates of Paradise is a Pope, (presumably a martyr, since he is wearing red), with two cardinals shown beneath him. The lack of thoroughness which permitted these decorations to survive is very uncharacteristic of the Swiss. I visited the Berner Münster at Christmastide, and there were quite a lot of seasonal decorations set up. 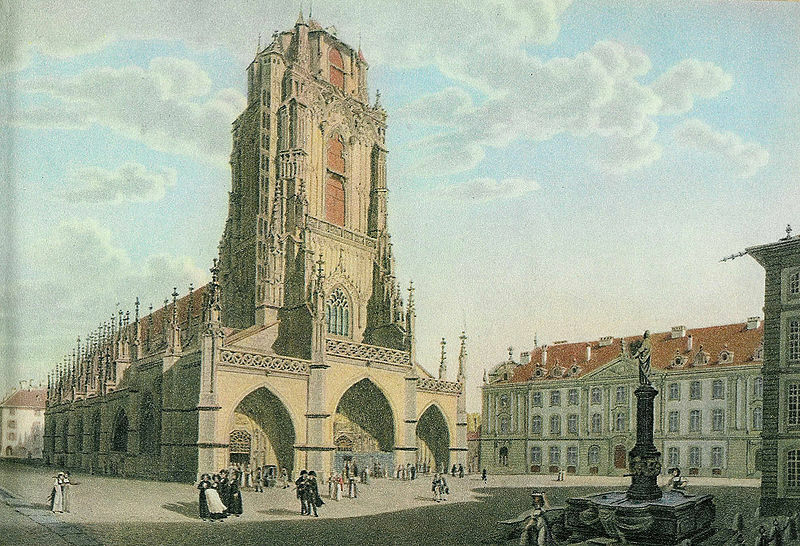 This photograph from Wikimedia Commons gives a better idea of how the church would have appeared for most of its history after the Reformation. As noted in the recent quiz, the pews between the pulpit and the table are reversible, so that congregants can face the pulpit during the very long sermons, and those services in the which no Eucharist was celebrated. (A reader informs me that such services were imposed upon the Calvinist churches by the local governments, and were not of Calvin's own design.) 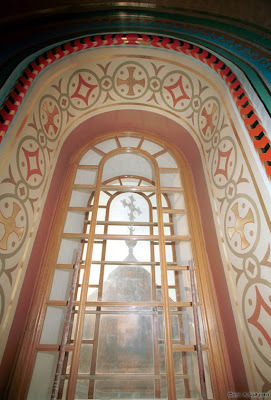 The truly eagle-eyed may also note that this photograph shows an hourglass on the pulpit (it is still there). I should be interested to know if a time limit was imposed upon the clergy by themselves or by someone else; any reader who knows is of course very welcome to comment. The angels on the two ends are holding the crest of Bern, named from a bear shot by the founder, Berchtold von Zähringer, while scouting out the Aare peninsula for a good place to found a city. 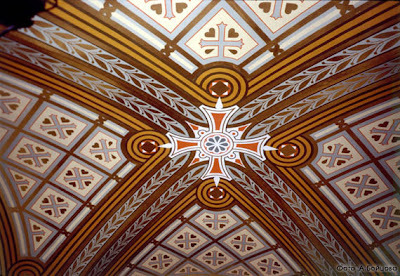 The ceiling of the apse, which preserves much of the Late Gothic tracery painted onto the vaulting. The crest of Bern appears again here, and throughout the building, since much of the construction was paid for by the city. The principal organ, built in 1726-30, above the main entrance. A large number of the pews are marked with the family crests, or initials, or both, of the owners, who had the use of the seats reserved. The full names are noted in an inventory, which is coordinated to the modern numbers added later. One can inquire at the bookshop about a particular name; my mother's paternal grandfather was born in Bern, but his family did not own a seat in the Münster. 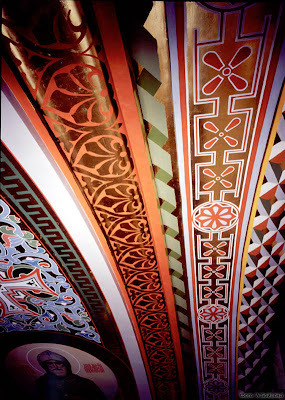 This section of the vaulting on the south side of the building, and the stained glass window beneath it, both have the family crests of the donors who paid for them. The portal on the north side of the building also preserves some very nice late Gothic stonework. I'm pleased to be returning as an active writer at the New Liturgical Movement site after more than a year of focus on our efforts at the ChantCafe.com. I hope to cultivate both going forward. NLM has a broad liturgical focus whereas the ChantCafe has a very specific interest in music as it applies to liturgy. Both sites have made huge contributions to our times of dramatic transition in the Catholic Church. The more I understand about this entire topic, the more it seems that music and liturgy they are really inseparable; the mark of a truly mature musician in the Catholic Church is the understanding that it isn't really about the music after all but rather the integral contribution that music makes to the overall ritual. The day after Shawn and I had visited about this topic and renewing the musical focus in this venue, the shocking news came that László Dobszay had died. I was stunned by this, and I'm sure many others feel the same way. He was a visionary, a genius, a truly innovative and brilliant thinker who understood the Roman Rite like few other living people. He was a mentor to me through his writings and his drive. He was also a very dear man. The presence of a mind like this in the world makes a person like me absolutely afraid to write anything at all, simply because he possessed universal knowledge of a topic that I can only hope to understand in fragments. But rather than look down on what I wrote or tell me that I should stop until I had mastered what I need to know, he was always incredibly encouraging, enthusiastic, gentle, helpful, and happy to see that so many people in his last years had taken up his cause. He must have felt like a lone warrior for all those prior decades. A champion of Dobszay's work has been Fr. Robert Skeris, who worked to bring Dobszay's writing to an English audience. When I first read the Skeris-edited book The Bugnini Liturgy and the Reform of the Reform, I was absolutely stunned. It seemed to bring everything together for me. Here was a severe critic of the structure and rubrics of what is known as the ordinary form today who was by no means an uncritical champion of the older form of Mass. Neither politics nor nostalgia interested him. He was passionate about the truth above all else. And the two truths that this book drove home were 1) the Roman Rite is intended to be a sung liturgy, and 2) the propers of the Mass are the source text for what is to be sung by the choir. A reform that he championed was once considered outrageous: he wanted the permission to replace Mass propers with some other text to be completely repealed. I've come around to this view. So have many, many others. In fact, it is a rather common view now, and one that even finds support in the new translation of the General Instruction on the Roman Missal. Of course he was a master in understanding the Gregorian tradition, and a true champion of the universal language of the Roman ritual. However, he was also nearly alone, for many years, in being an advocate of sung vernacular propers in the ordinary form. For years, I couldn't understand his thinking here. Why vernacular? Well, Dobszay saw that there was a step missing in the achievement of the ideal if we expect to take a leap from the prevailing practice of pop songs with random text to Latin chant from the Graduale Romanum. That step was to sing the Mass texts in the vernacular according to a chant-based idiom drawn from our long musical tradition. He turns out to be incredibly correct on this point. In fact, he was the true inspiration behind the Simple English Propers book that has permitted regular parishes to start singing chant for the first time. This book and so many others are part of his legacy that he left in this world. In fact, I would even suggest that the new translation of the Roman Missal that is implemented this Advent owes much to his influence. The following audio and photographs come from a Solemn Mass in the Dominican Rite celebrated for the Feast of St. Dominic at Blessed Sacrament, Seattle. This recording was provided courtesy of Jesson Mata who acted as subdeacon in the Mass. The choir performed Taverner’s Missa Gloria Tibi Trinitas. Archbishop J. Peter Sartain of Seattle was in choir for the liturgy. The Dominican Priory of the Holy Cross in Leicester (U.K.) will celebrate a votive Mass of the Exaltation of the Cross on Saturday 10th September at 2pm. This will be a Dominican rite 'Missa Maior' (High Mass), and it is believed to be the first such celebration at the priory since the 1960s. In related news, the friars of that priory have produced a booklet containing the Ordinary of the Dominican rite to help those who are able to assist at Mass daily in this rite. The booklet is available via Lulu. The photo on the right shows the relic of the True Cross in its reliquary. The relic comes from Bornhem in the Spanish Netherlands to which the Dominicans had fled after the English 'Reformation'. When the friars returned to England in the 18th-century, this relic came with them. 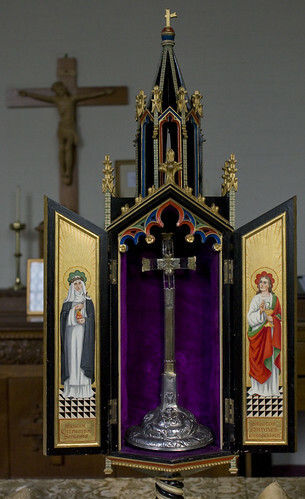 They established a priory at Leicester where this relic of the holy Cross is still venerated. 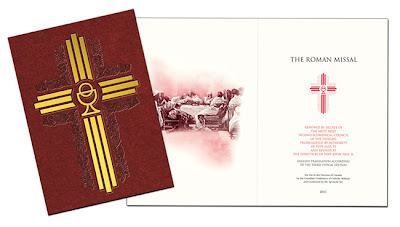 The Liturgical Institute announces a national event to prepare the Catholic faithful for the implementation of the third typical edition of the Roman Missal. Mundelein, IL, August 4, 2010— The October event, part of the program of Mystical Body, Mystical Voice: Encountering Christ in the Words of the Mass, will be a comprehensive one-day workshop to prepare the Catholic faithful for the implementation of the third typical edition of the Roman Missal in November. Developed by Liturgical Institute faculty members Fr. Douglas Martis and Mr. Christopher Carstens, the Mystical Body, Mystical Voice program brings a unique approach to liturgical training. “We see the implementation of the Missal as a chance to enrich the lives of the faithful with a deeper understanding of the sacramental nature of worship, whose purpose is to glorify God and sanctify His people,” said Liturgical Institute Director and sacramental theologian Fr. Douglas Martis. Christopher Carstens, the Director of the Office of Worship for the Diocese of Lacrosse WI, describes the rich theology and positive pastoral approach of the workshop. “We are doing much more than telling people that the Missal used to say this and now it says that. Instead we are discussing the central mysteries of the Faith: how we offer worship to the Father and become conformed to Christ,” Carstens said. 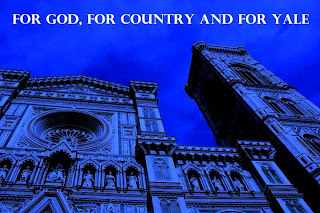 “Those powerful words of Vatican II calling for full, conscious, active and fruitful participation in the sacred liturgy ask us to know why words matter and what words mean when they come from Christ and His Mystical Body. The workshop will take place on October 8th at the University of Saint Mary of the Lake, Mundelein, IL. from 8 a.m. to 4:30 p.m. Topics will include an introduction to liturgical and sacramental theology, the principles of language in the liturgy, and the texts that will change when the Third Edition of the Missal is implemented in November. Online registration is available at the website: www.mbmv.org. Early Registration is $45 per person, and includes lunch and a copy of the Mystical Body, Mystical Voice participants Guide. Group discounts are available. For more information, please contact the Conferences office of the Liturgical Institute at 847.837.4540. What Happened to the Liturgically-Interested University Blogs? With all things there is a season of course, but I remember a time not so long ago when there were some liturgically-interested blogs coming out of some of the Catholic universities (Notre Dame for instance with the Shrine of the Holy Whapping), some of the American Ivy League schools (For God, For Country and For Yale and The Cornell Society for a Good Time -- to name two I can recall) and there seemed to be a bit more coming out of Catholic Oxford and Cambridge. Now, evidently, students eventually graduate and shift from being students to being alumni. In other instances they move from undergraduate to graduate work and are likely to shift academic institutions in the process. That is the first point. So one cannot expect, of course, that the blogs of particular individuals at these institutions might run forever -- and if they did, by a certain stage they'd become something else. However, while I say, "to all things there is a season," what I am not suggesting is that there is perhaps a lack of such individuals in our academic institutions. Through public events and private correspondence I know for a fact that this is precisely not for lack of individuals or activity. So that being the case, where are the successors to the sorts of blogs I have already referred? 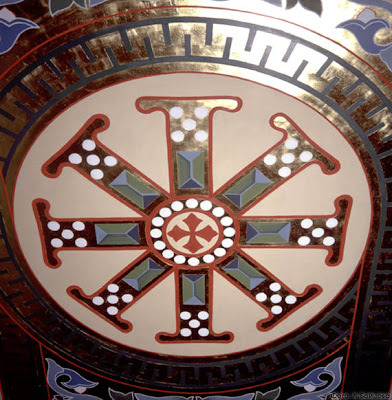 Blogs that, amongst other things, detail some of the writers' liturgically oriented aspirations, projects and positions and report on similar sorts of events in their academic institutions and locales? This list is by no means comprehensive of course. But how to handle the problem of the transitory nature of life in an academic institution? My own thought is that this is where the group blog might be particularly useful. 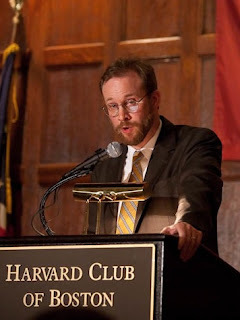 Having a few writers and making a concerted effort to recruit new writers over those years would go a long way to help preserve this particular voice in particular institutions -- one which, I might add, is not only of great inspiration to a broader audience but is also useful for coordinating the new liturgical movement. Where it makes sense, some alumni could even stay on until the torch has been passed to the newer generations. Still, even individual blogging projects ought to be encouraged. So then, we're coming up to a new academic year in the next few weeks and with that, might I encourage those of our readers at these or other academic institutions to pick up on this enterprise, writing on and reporting on (and indeed thereby also contributing to) the efforts of a new liturgical movement in your area and/or institution. I am convinced that this voice is not only desired, it is also needed. Many of our readers will be amply familiar with the Thomas More College of the Liberal Arts (TMC) in New Hampshire. I had the opportunity to visit this college last autumn when I delivered a talk on the new liturgical movement and was quite impressed with what I found there. Fr. Thomas Kocik was recently involved at the school for a symposium on Catholic art, and of course, David Clayton is the college's artist-in-residence where he runs the Way of Beauty programme. My positive experience and impression of the college was continued when I learnt that the liturgical life of the college was now expanding to further include the usus antiquior. 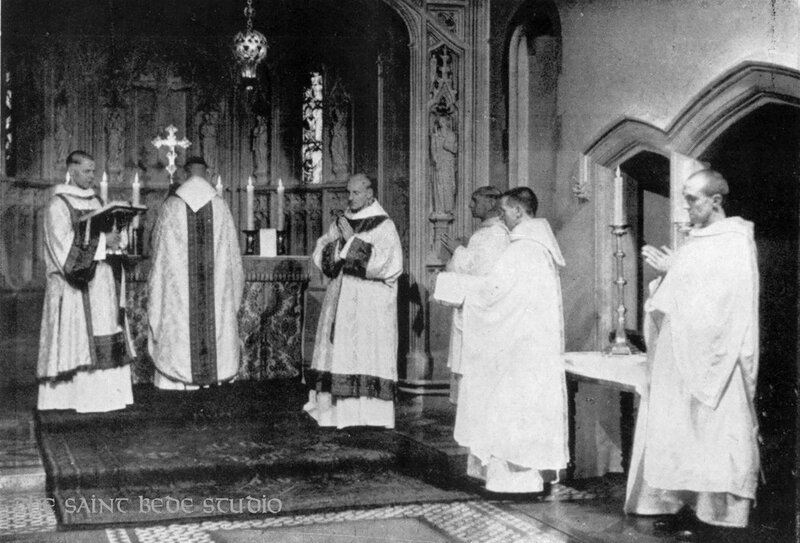 What generally encourages me is the "both-and" approach being fostered here, and it is in a few regards: first, as regards the use of the two forms of the Roman liturgy; second, the use of the liturgy of Roman West and Byzantine East; third, that their liturgical life includes both Mass and the Divine Office; finally, that their approach encompasses both the sacred liturgy while also giving presence to Catholic devotions. The NLM is pleased to share the following announcement which we requested of TMC when we were informed of this development. Please note, there is an appeal following the announcement. I would encourage you to consider showing your support for Catholic colleges which take the sacred liturgy seriously. I know there are other Catholic colleges who would fall into this category: we at the NLM want to hear from you as well. One may be surprised to learn that the Thomas More College of Liberal Arts has not offered regularly the Extraordinary Form of the Mass on its campus. After all, this is a College centered tightly on the liturgy of the Church, beginning each day by chanting Lauds, offering the Holy Sacrifice of the Mass just before lunch, and singing Vespers upon conclusion of the day’s classes. Thanks to the recent clarification of Summorum Pontificum by the Holy Father in Universae Ecclesiae, Thomas More College will now celebrate the Extraordinary Form, and will commence with a special celebration on October 7—the Feast of Our Lady of the Rosary. The Mass will be offered in accordance with the rubrics of the 1962 Missale Romanum. Thomas More College is one of the few institutions committed to exposing its students to the full treasure of Catholic liturgy with the values of the new liturgical movement of Pope Benedict XVI in mind, especially in regards to the dialogue between the two forms and additionally by giving exposure to both Western and Eastern Rites. Masses at the College are celebrated ad orientem with some offered in Latin and others in the vernacular. The student body as a whole chant the responses. The Divine Office is chanted in both Latin and the vernacular. Inspired by the new Anglican Ordinariate, the chant in the vernacular looks to the tradition of Anglican chant—and its roots in the Pre-Reformation Sarum use. The Melkite liturgy is also offered once per month and is well attended by students and faculty. In Rome, our students stay in an Eastern Catholic monastery and are able to participate daily in the Maronite liturgy. Upon taking the helm as president of Thomas More College two years ago, Dr. William Fahey deepened the College’s focus on the Faith. In addition to daily Mass, the Divine Office is chanted daily and Catholic devotions are encouraged. The College is dedicated to the Sacred Heart of Jesus, Exposition of the Blessed Sacrament is offered weekly, and regular retreats introduce students to such practices as Lectio Divina and the practice of “compunction of the heart” (The Rule of St. Benedict recommends this especially during Lent). Students are encouraged (but not obliged) to participate in spiritual direction, which is available from the College’s three chaplains, to assist young men and women in developing a well-balanced spiritual life. Of course, as an institution of higher education, Thomas More College’s chief mission is the education of students. As a Catholic institution, its chief responsibility is to form young minds and souls consistent with the teachings and traditions of the Roman Catholic Church. But the College uniquely recognizes that the liturgy of the Church permeates all aspects of life—including the intellectual life—and so it has renewed its own liturgy consistent with the principles of the new liturgical movement. As the College prepares to offer the Extraordinary Form each Friday, it has launched a small campaign to raise $5,000 in funds to purchase items necessary for this celebration, including altar cards, copies of the Ordo for Mass and Divine Office, servers’ manuals, vestments, a vesting prayer card, a biretta, Missal stand, and other items. If you are willing to assist the College in purchasing these items, you may donate via the College’s web site here. For questions, contact Charlie McKinney at (800) 880-8308 or by email at cmckinney@ThomasMoreCollege.edu. My compliments to the many who guessed that it is a reversible pew, which can be switched around so that the back becomes the seat, and the seat becomes the back. This is done so that worshippers can face the pulpit (not a side altar, nor the baptismal font, in this particular case); the white marble in the upper left hand corner of the photograph is the staircase leading up to the pulpit in the middle of the building. The church in question is the Berner Münster, formerly the Catholic cathedral of Bern, Switzerland, converted to Protestant worship in 1528. I have no expertise in any form of Protestant rite, so correct me if I am wrong, but I am given to understand that Calvinist churches often had services with no Eucharist, just Biblical readings, hymns and sermons, the latter being very long indeed. Such services would have been led from the pulpit from start the finish, so obviously, it would be rather inconvenient to have a large portion of the congregation facing the table. In our previous quiz, the Most Creative Wildly Incorrect Answer and the Best Humorous Answer awards both went unassigned; this time, the contenders in both classes are almost too close to call. 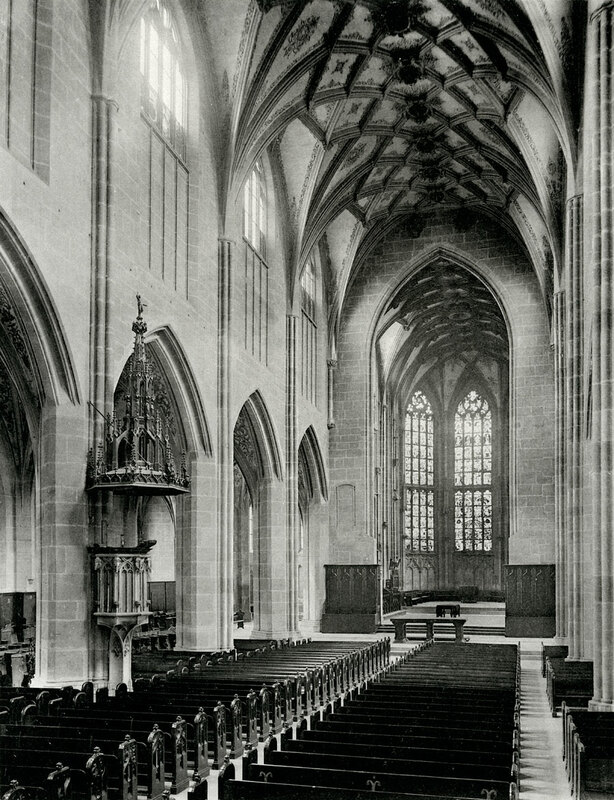 After due consideration, however, the former is awarded to J.C. Saulnier’s guess that the pew is reversible “to allow for a certain type of public penance whereby the penitent was not permitted to look towards the altar.” The electoral college (i.e. me) assigns Best Humorous Answer to Joe Walberg, “For bad worshipers who get put in time out,” although the popular vote went to John Hudson “where people who object to the priest 'turning his back on the congregation' sit in protest.” Next quiz in September! It is with great sadness that I must pass on the news to our readers that after a month long battle, Professor László Dobszay died last night. Many of you will know Prof. László Dobszay from his two written works, The Bugnini Liturgy and the Reform of the Reform and more recently, The Restoration and Organic Development of the Roman Rite. Prof. Dobszay was a Hungarian who was very active in the scholarly liturgical community, an active promoter of the liturgy generally, and particularly sacred music and the divine office. He will be missed. More details forthcoming. In your charity, please offer your prayers and Masses. 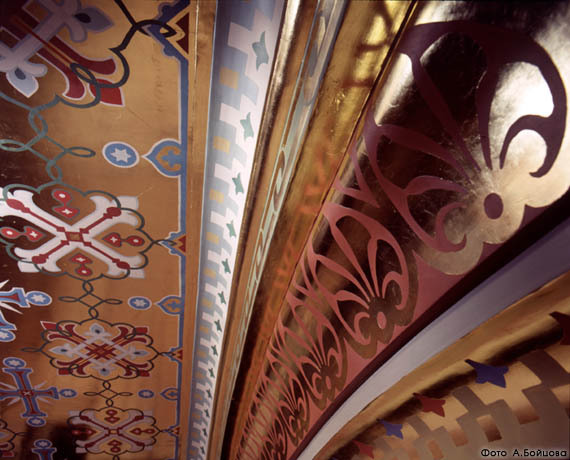 Last year I featured some wall paintings of the Trinity at the Russian Orthodox Cathedral of Christ the Saviour in Moscow, left. 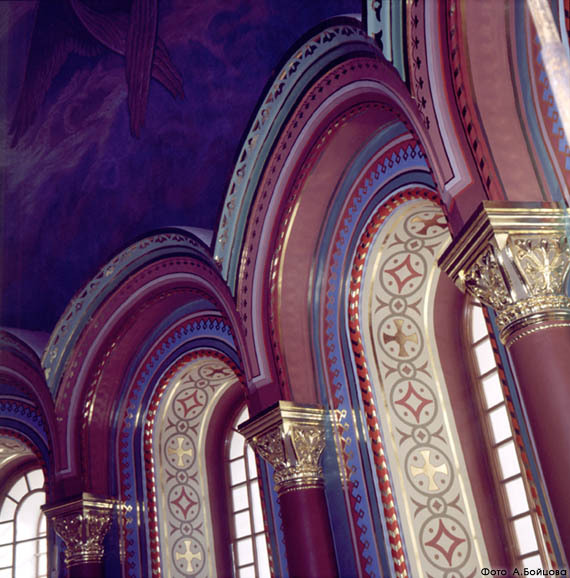 This is a modern reconstruction of a 19th century church and all the art from that time has been faithfully reproduced too (I hadn’t appreciated this until an NLM reader pointed it out to me!). As well as some striking naturalistic and iconographic art, there is some beautiful geometric and patterned art as well which I show here. This reminds me in some ways of the decoration one might see in an English 19th century neo-gothic church designed by Pugin. 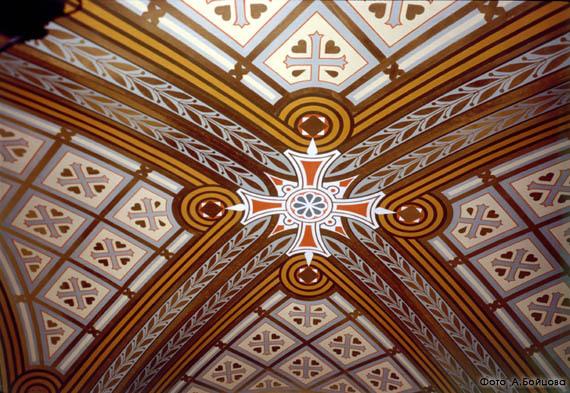 Anyway, I hope that this will inspire those who are responsible for the interior decoration of our churches to consider geometric designs as an option. Evidently this is encouraging in and of itself, particularly as we look forward to the use of the richer translation. That said, as with everything at the service of the sacred liturgy, it must speak to the overall dignity and importance of the same. Indeed as Benedict XVI has commented, "Beauty is not mere decoration, but rather an essential element of the liturgical action, since it is an attribute of God himself and his revelation." What has been opted for is a style that has not really proven itself lasting -- already being jettisoned, certainly popularly, but even ecclesiastically. Let us compare the designs of the bindings of two other editions of the revised Roman missal. As well, the internal art of this new edition of the Missal, which is "based on the work of Jacques Joseph Tissot", a 19th century artist, struck me as rather lack-lustre from what we are shown of it. Indeed, it seems to lack iconographic depth and richness in my estimation and strikes me as the sort of illustration that might better accompany an illustrated book than a Missal which is to adorn our altars. Indeed, I find the much debated art of the new Italian lectionary of greater substance, interest and inspiration -- and this despite my own hesitations about that particular type of art within a liturgical context. Strange too seems the idea, presented in the explanation for the rationale behind these choices, that there is going to be a future determination as to whether there "is a need for a deluxe version, one with a limited use of four-colour plates and leather binding. Such an edition would clearly not normally be for everyday use, but would be reserved for special occasions." Evidently one can understand the idea of that which is more ornamental for more solemn liturgical occasions (a thing we see is vestments, sacred music and so on), but it seems to me what is proposed should rather be the base standard for an altar missal and not rather the higher bar for "special occasions." We all certainly look forward to the implementation of the new English translation of the Roman Missal that much is certain. But one thing seems clear to me, and this is that the Canadian edition pales by comparison to its American and British counterparts. In that regard we seem to have a case of a lost opportunity. A few weeks back I wrote in these pages that the new Roman Missal, which will come into effect this Advent, should be beautiful, worthy of being on the altar during Mass. 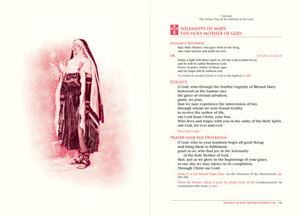 The missal is the book used by the priest, which contains all the Mass prayers. A new English translation of the missal has been prepared, and so new missals are required in every Catholic parish. The current missal produced by the publications service of the Canadian Conference of Catholic Bishops (CCCB) is most unworthy, lacking even the creative design of a low-end recipe book. Canadian priests were hoping that the new missal published this fall would be a true work of art, not a mere functional instruction manual. We saw that publishers in England, Australia, and the United States had sample pages posted online, drawing upon the long tradition of Catholic art adorning the altar missal. I wrote that if the CCCB version was as unimaginatively plain as their existing work, Canadian parishes should consider buying a British or American missal. All the prayers are exactly the same and the minor adaptations for Canada - local saints and variations in the rubrics for Mass - are easily enough obtained elsewhere. Dr. Glenn Byer, director of the CCCB publications service, referred to me as an "unofficial spokesman" promoting "American publications." I am a spokesman only for my own views. He of course is "official" insofar as his job is to sell these missals. 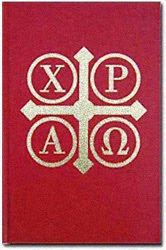 Concerning the promotion of American products, I want a beautiful missal, not an American one. If Canada's only missal publisher cannot get the job done, then being of catholic sensibility I would be happy to get one from Britain, Kenya, or the Bahamas. The new missal should be an occasion for the CCCB publications service to show that it is the equal of anyone in the world. Dr. Byer writes that the CCCB missal is entirely Canadian-made and that "there is a beauty in this too." Really? Wrapping an ugly thing in moosehide and soaking it in maple syrup does not make it less ugly. Being made in Canada does not make something beautiful. It accomplishes other goals, but why set in opposition beauty and local production? 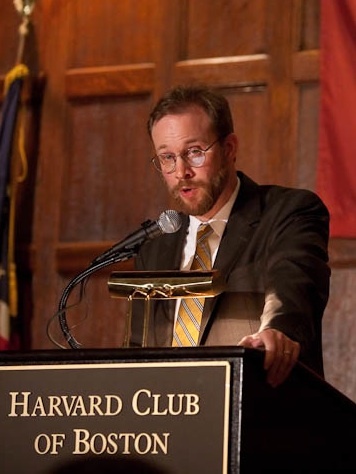 More troubling still, Dr. Byer seems to miss the entire point of publishing beautiful things for Mass. He argues that there "is nothing more beautiful than the contents of the antiphons and prayers ... these are the stars of the book, not an abundance of colour plates." Yes, obviously the words are more important than how they are printed, but in that case why not just print a daily sheet in the office and save all that flipping of pages in the missal? The book should be beautiful because the words are important; Dr. Byer gets it backwards, arguing that the book should be plain so as not to distract from the words. 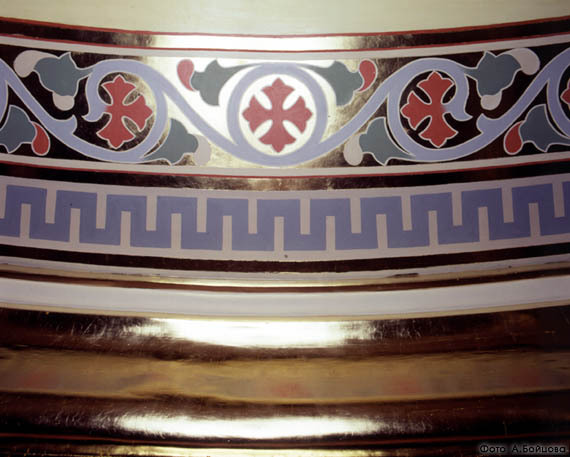 That argument was used for generations to justify hideous vessels for Holy Communion, but no serious person argues now that a beautiful ciborium or chalice distracts from the Eucharist itself. Dr. Byer is altogether too defensive about his project to inspire confidence among the parishes, which will soon be asked to spend considerable sums on it. Indeed, seeking to justify his decision to use black-and-white drawings from a 19th century French artist rather than full colour reproductions of the masters of Catholic painting, he argues that "hundreds of colour plates" would distract from the words. 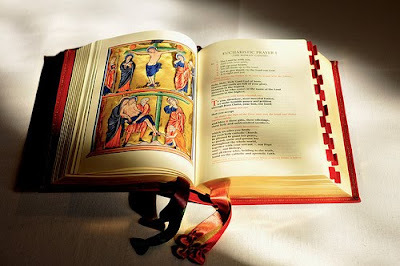 Perhaps, but no one was arguing for a coffee-table art book, just a suitably decorated missal. The British version has 15 colour plates, and the most elaborate (horrors!) American version has 49. There would be an illustration for the most solemn feast days, and perhaps a few others for the ordinary of the Mass. That should not prove overwhelming, even for the most aesthetically deficient priest. The CCCB approach is deeply discouraging, saddling Canadian parishes with inferior products for the foreseeable future. Dr. Byer writes that after everyone has bought one of the CCCB missals, perhaps a more "deluxe" version might be produced. But such a version would not be for "everyday use" but only "special occasions." Therein lies the major difference between this "unofficial" priest and the CCCB's official director of publications. 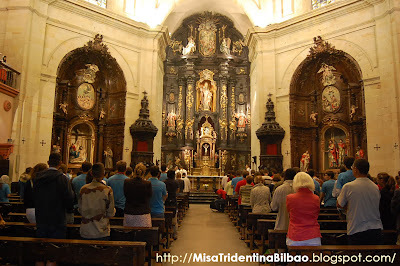 I rather think every Holy Mass is a special occasion, worthy of the best we can manage as Catholics. And I don't think being Canadian is an obstacle to that. Parishes should not buy American. Or British. Or Canadian. They should buy beautiful. Father Raymond J. de Souza is the pastor of Sacred Heart of Mary Parish on Wolfe Island, and chaplain at Newman House at Queen's University in Kingston, Ont. By way of the site of the Liturgical Pimpernel came a photo coming from Prinknash Abbey which struck me. 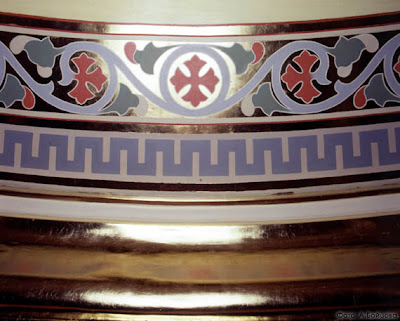 I determined that I would look this up further and was delighted to find even more of these photos on the blog of the Saint Bede Studio (which post incidentally, to bring it all delightfully full circle, was itself inspired by a post on Prinknash Abbey which appeared here on NLM). As Michael Sternbeck of Saint Bede notes, these images appeared in O'Connell's The Celebration of Mass and were taken with permission of the then abbot, the Right Reverend Wilfrid Upson, OSB. Images as these always bring to mind for me the great richness of the earlier monastic incarnations of the 20th century Liturgical Movement. Speaking personally, while I am quite pleased at the baroque and renaissance revivals we have seen in the area of vestments and vesture, it would be gratifying to see more revivals of the particular styles seen here as well. 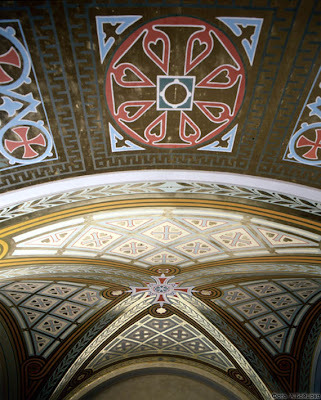 There are actually more images than what appears either here or at Saint Bede and I may take the time at some point to get higher resolution scans of all of these photographs.